The prisoner exchange with Hezbollah, which is expected to happen in a week or so, will include the body of Palestinian terrorist Dalal Mughrabi, according to the Palestinian news agency Ma’an. They can have her rotting bones. She was the leader of a unit of eleven Palestinian Fedayeen who perpetrated a bloody massacre in March 1978. Landing on the beach near Kibbutz Maagen Michael in rubber boats launched from Lebanon, the terrorists met an American nature photographer named Gail Rubin and executed her for taking pictures of ‘Palestine’ without permission.Then they hijacked a bus carrying Egged (the bus cooperative) employees and their families on an outing; there was a shootout with security forces, the terrorists shot many of the passengers and firebombed the bus. Some 35 Israelis, 13 of them children, were murdered before the terrorists were killed. The event is usually called the “Coastal Road Massacre”; Israelis also call it the “Bus of Blood”. 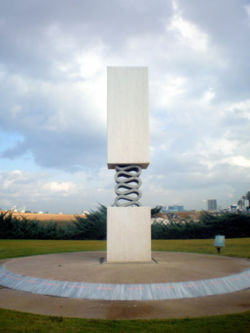 Above is a picture of the monument to the victims along the coastal road near Herzliya, where the bus stopped. To this day, Dalal Mughrabi is a heroine of Fatah, the ‘moderate’ Palestinian leadership for which my tax dollars are buying guns, ammunition and armored vehicles. There are several girls’ schools, summer camps, and kindergartens named after her. Her name has been given to soccer teams, to police training courses, and to numerous children. There are annual ceremonies and TV broadcasts celebrating her ‘heroic action’ [Palestinian Media Watch]. An official PA pamphlet obtained by WND asks Fatah leaders in the Gaza Strip and West Bank to prepare victory celebrations for the day Mughrabi’s body is released by Israel. “We call upon all regional Fatah leaders to make the necessary activities, demonstrations, festivals and symbolic funerals in a very significant way to glorify this big hero. We call upon Fatah sections to form special committees with the mission of coordinating these preparations,” read the pamphlet. The communication went on to call for Israeli Arabs to also celebrate the release of Mughrabi’s body. The pamphlet was sent from the PA’s “ideological and organic” department, which is led by Chief Palestinian negotiator Ahmad Qurei, who has been overseeing Israeli-Palestinian peace talks initiated at last November’s U.S.-sponsored Annapolis summit. According to PA sources, preparations are underway for Mughrabi to be buried in the West Bank city of Bethlehem, which is home to the Church of the Nativity, the believed birthplace of Jesus. When the official heroes — not the cult heroes of some extremist group, the official heroes of a people that wants to become a nation — are murderers and terrorists, creatures that would kill a nature photographer in cold blood because she had the temerity to take pictures of what they claim as theirs, monsters that would shoot and burn children on a holiday outing, then what does that tell us about that people? And what does it tell us about their leadership that promotes this sickness? Here is what Israel should say to Fatah: here are the bones of Dalal Mughrabi, whom you hold up as the model for every young Palestinian girl. Have big funerals with lots of shooting in the air and giving out of candy. Talk about her heroism in confronting the Zionist oppressors (like the Zionist oppressor children of bus drivers). Make speeches about redeeming all of Palestine with your blood, display pictures of ‘martyrs’, and above all of the Original Terrorist, the father of the Palestinian nation and still its inspiration, Yasser Arafat. We know that there can be no peace with you. We know that giving you a state, giving you anything, will only bring your terrorist ‘heroes’ closer to our population. We know what’s in your hearts because you tell everyone who is willing to listen, and the message has come through loud and clear. You are our deadly enemies, and peace will not come until you no longer have the power to hurt us. And we are going to do whatever we can to bring about that state of affairs. Just what this will mean to you in practice is up to you. This entry was posted on Sunday, July 6th, 2008 at 10:05 pm and is filed under General, My favorite posts. You can follow any responses to this entry through the RSS 2.0 feed. Both comments and pings are currently closed.